The world’s lightest aluminum low-profile baitcaster (just 6.7 oz.) 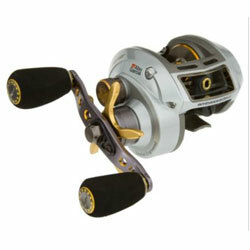 is an incredibly sleek, ultra-low profile reel packed with Swedish reliability. Featuring compact Bent Handles for cleaner, more natural operation, the Premier has dual cast control—an externally adjustable hybrid magnetic/centrifugal brake system that offers a much wider range of fine-tuned performance! "this reel is just outstanding. the only complaint i have is that it is tough to cast a lure less than 1/2 oz. the braking system is great and i have only backlashed once and it was because the line slipped under my thumb." "Excellent, excellent real. Smooth, light, strong...and worth every penny. I was a little hesitant about spending the money and just going with something a little cheaper....but didn't. Wise decision. " "By far this is the best reel ever owned!!! No point of comparison with any other!!!! Performs excellent with any line. On first fishing trip using we catch something like 160 Black bass in a 2 days trip to Lake Aguamilpa in Mexico." According to the general online consensus, where our research is based on unbiased customer comments and user feedback, this is a good reel and good value for the money. There were some negative comments about this reel, but not enough to give it an overall negative rating.